Interesting design. How do they keep the entire mirror assembly from rotating though? 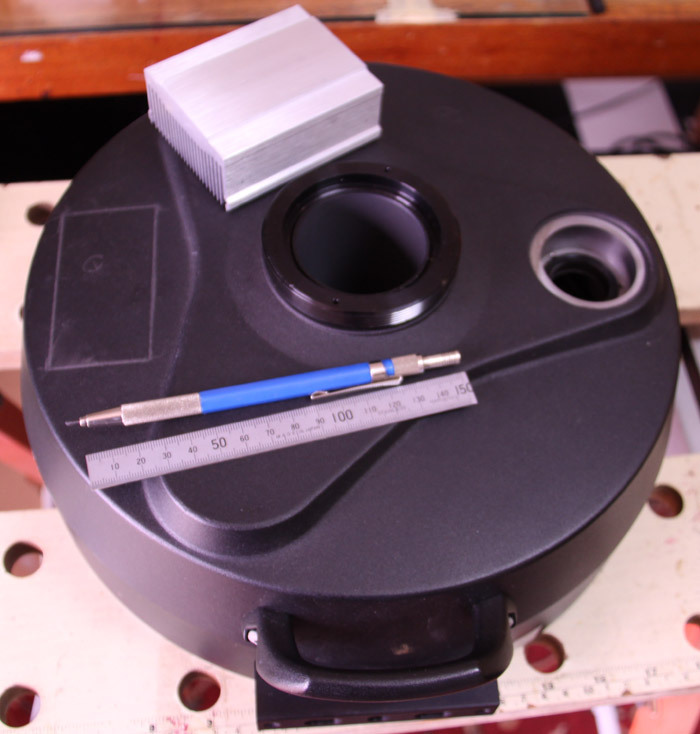 The main baffle has a groove and the mirror mount uses a pin that rides in that groove. This keeps the mirror from rotating. You can see both on the last image. Edited by PowellAstro, 12 September 2015 - 10:38 PM. Ah..I think that see what you guys are talking about. Some of the older C14s just had a clearance hole in the rear casting. That's what I had in my former straight C14 and that's what I was thinking about. In that case, it is indeed quite possible (and even easy) to turn a long screw into the back of the mirror. If both holes are threaded, it sounds like you are trying to gently cross-thread the through-bolt. So are you focusing the system to correctly set the BWD and then trying to lock the mirror? Unless you have an external focuser, I'm not sure how you are going to achieve accurate focus without a whole lot of messing around. As I've said, this whole approach has the potential to put a lot of torque on the baffle tube and to drive the system out of alignment. I will also point out that the rear support plate for the primary is a cast aluminum part. I haven't messed with it a lot but I'd be a bit cautious about cross threading screws into it. I've observed that some of the metal parts in the system are pretty soft and I don't know if that cast part has been heat treated in any way so it may strip out pretty easily. You can probably get a way with it if you are gentle but if you are tightening and loosening frequently, you may eventually strip the threads. I completely agree that this is not a recommended way to fix anything. If you want to fix the mirror position the right way, you are better off just taking the system apart and using three stout standoffs to screw the mirror down in the correct position. I don't recommend it to Randy for the reasons given - but it is a completely stable method: true the arms (triple-tree) is a cast item but we actuate the primary with this & some folks use it as their only focusing mechanism as per Celestron intentions...this would involve similar if not greater risks in the manner you mention tbh! Kokatha, the reason I chose the XLT over the Edge, (aside from price) is I am not crazy about having a permanent field flattener inside the tube. I also wanted my 13.5" of clear aperture unimpeded by glass, dust buildup or whatever. So, let me ask you as a planetary expert, do you think the Edge would be as good as the XLT. My opinion was the XLT would be slightly better for galactic images near the center of fov. Also, it's too bad they can't put the same mirror lock mechanism on the XLT as Edge. Edited by RandyC, 13 September 2015 - 08:27 AM. Planetary imagers who I respect such as Glenn Jolly (Desert rat) use Edge C14's & I see nothing that indicates he is handicapped because he is using that particular model...about the only thing I can glean is that those coolers (can't remember their name atm) that blow air up the baffle & into the OTA proper will not work because the baffle is blocked by that lens element - but imho those types of coolers are pretty pathetic...although that could be because of the demands of Australian weather conditions. DSO's aren't my expertise Randy so I can't comment thereon, but I guess the centre of the FOV isn't really why they created the Edge series! It does seem ridiculous not to incorporate the same basic features on each model version but I guess they consider the Edge their "premium" scope & wanted extra bells & whistles for it: I use the XLT also & it is a planetary imaging scope par excellence...thank goodness Celestron realised making 2 different back-castings was bad production economics for themselves & used the same vented casting for the XLT also...a pity they stopped at that point! The vents made it easy to add a mirror temperature sensor without dismantling the scope completely...I've done enough of this dismantling with Celestrons to last me a fair while before I want to do it again: this is also the reason why I affixed the guide blocks for the mirror locks in the manner I did as per the pik a few posts back - not my preferred method but I did manage to make them appear quite reasonable cosmetic-wise & they'll function just as well...but drilling out the back-casting thread-holes & re-tapping for a larger diameter would've necessitated a complete dismantling which I wasn't prepared to do, not with the Uranus & Neptune apparitions as they are presently! * We suffer from a lot of fogging/condensation INSIDE the OTA, even on the secondary where it is especially problematic: I am fitting 2 fans, one an intake & the other an exhaust to the vents a la "Tempest" etc...except my unit is incorporating an acrylic/Perspex canister on the intake which will be filled with self-indicating granular (2.5mm-5.0mm) silica gel - a neoprene gasket under the corrector as well...I don't want to introduce additional air into the tube (for quicker cooling) if it brings in loads of water vapour given our problems therein of late! The main difference with deep sky is it's a low-light condition. For example, a barlow will produce basically nothing in a dso image. Expanding aperture to a 14" brings out slightly more detail than an 11", for example. Adding a focal reducer will speed up imaging times but reduce magnification. In my opinion, a flattener will reduce effective aperture. Celestron makes some of the highest magnification (focal length) SCTs. Having a full frame sensor, gives you the entire fov to work with requiring only a crop. John thanks for your help on adding the longer screws. I am just worried I cant make any focus adjustments. It seems a little ridiculous they couldn't make the stock screws fit the entire focus range. I am going to talk with Celestron tomorrow. Compared to my 11" the aberration is excessive. Edited by RandyC, 13 September 2015 - 10:11 AM. Of course, there is the added benefit of being able to lock the mirror on a non-edge C11. Hmm... help me to understand why you believe that "a flattener will reduce effective aperture" and which pupil are you talking about? Because everything comes at a cost. You can't flatten the field and also maintain the same resolving power. Something has to give. It's a shame Celestron went with the RASA instead of focusing on larger lighter scopes and these issues. I think that it is possible to reduce SCT mirror shift by using rods, or other methods, to stabilize the mirror cell, but, IMHO, it is not possible to eliminate it entirely. SCT mirrors cannot be locked rigidly or they will deform with temperature change. The mirror is typically fixed in the mirror cell with a rubber/silicon, or other, compound that allows the mirror to expand/contract and thus flex slightly over time and the larger and heavier the mirror, the more this is likely to happen. I've read through this thread but did not see this question: Can you add some type of add-on mirror lock to older SCT's (N11GPS)? Thanks for referring to the paper that Celestron put a ton of effort into when designing the EdgeHD. I believe their off- and on-axis analysis relates to a flat versus spherical field. The corrected EdgeHD field will definitely display better optical characteristics. The resolution they are referring to is the accuracy of the light beams themselves. What I am saying is that to transform the spherical to flat field using a flattener has a cost. The cost is to the detriment of overall resolving power of the distant object being observed. It is the resolution as relates to the aperture of the scope. In other words, the Celestron analysis of optical resolution is going to be basically the same for an 8" or 14" scope (see pages 7 and 8). The resolution I am referring to is obviously much better in the 14". Hi Mike - not sure what the N11GPS looks like at the back - is it this first pik below..? Complete with home-made knobs using soft drink caps - I was scratching a bit for money in those days!!! This was an excellent planetary imaging scope: there is no reason any of the more sophisticated versions of the mirror locks such as those I've recently made couldn't be engineered to these scopes...the only other comment I'd make is that like Psyire you need to affix any rods/bolts to the triple-tree if it doesn't have threaded holes already there & of course drill the rear-casing/casting - Psyire used JB Weld...I drilled & tapped holes into those other 2 arms - "yes John" - you certainly could hit the primary glass with the drill when it goes through...but I'm an old dog who has picked up a trick or 2 over the last 60-odd years! As someone has pointed out these types of mods are NOT perfect...but it's the same with almost anything tbh, you can always find faults/issues - but to all intents & purposes their effect is very good/positive: we collimate on a star near our target planet & I have every confidence over the course of 1-2 hours either side of transit this collimation will be stable. No, that's not right. The optical design process works to minimize various parameters by optimizing numerous variables. The variables are: radius of curvature, index, dispersion, aspheric coefficient, spacings, etc. The more things that you want to correct, the more variables you need--and that may require adding components. In the case of the Edge system, adding two lenses near the rear of the system, allows excellent correction over the whole field as well as a flat field. The diffraction limited flat field extends over quite a large field. For example, the 8" Edge has a roughly 0.75 degree diffraction limited, aplanatic flat field. For further reading, I suggest that you look at "Telescopes, Eyepieces, Astrographs; Design, Analysis and Performance of Modern Astronomical Optics" by Smith, Cerogioli, and Berry. Thanks for that - very interesting! No, my scope is older then that - the rear panel is flat and metal. I guess my real question was if anyone sold some type of mirror lock kit or service (like Hypertune, but for old SCTs - someone needs to do this)? It would not be a good idea for me to take a drill to my scope - at all. There are a couple of other approaches but all probably involve taking a drill to your scope - & I can understand folks' reluctance to do what seems like risky business..! Of course you would still need to take your scope apart for this..! In those circumstances where nothing is/can be/risked being done I'd just reiterate the practise of an anti-clockwise twist of the primary focuser knob as your final focusing adjustment...regardless of whether you have an after-market focuser fitted or not. If I get 2 custom bolts made that are longer, can this easily be fixed in a newer C14. If I alternately loosen and tighten these nuts while adjusting focus, will it even out. Or do you have to put so much torque on the mirror plate, that something will give way. 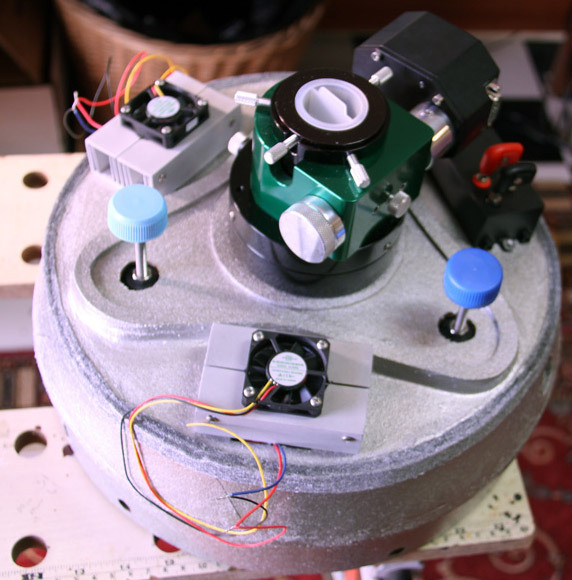 Is using the focuser as one of the torque points too risky that something will strip? Thanks. Here is a different concept. 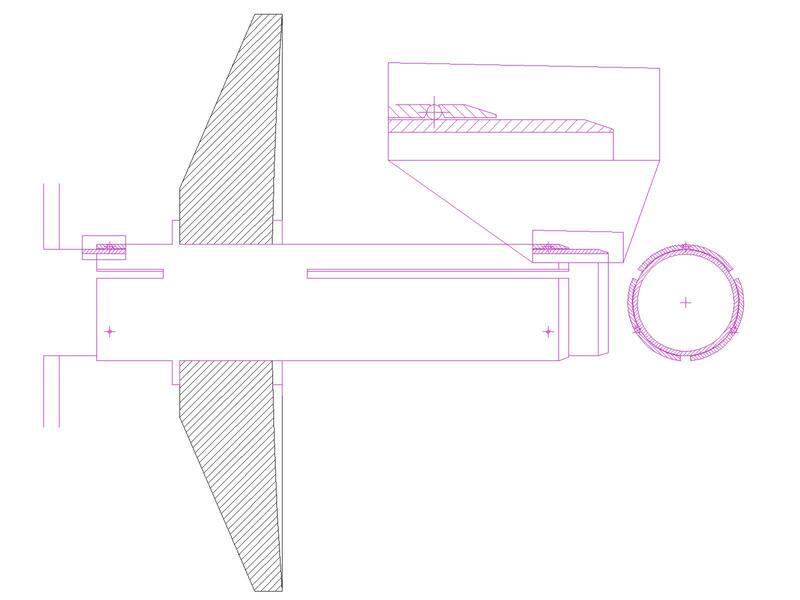 A different approach for the focuser sliding tube arrangement. I sketched one up years age for the Questar 3.5". The Q7 uses linear bearings to prevent focuser shift. Not enough room in the Q3.5. I never had time to make some pieces and experiment with the idea. This drawing is just a quick sketch to eyeballed C14 dimensions. Thanks, that looks like an interesting idea. The challenge is to get everything zero clearanced and smooth. If you look at the tolerances needed to hold the image steady to within say an Airy radius, the angular slop allowed back at the primary is absurdly tight. So a good solution really needs to be kinematic to insure that the constraints are about the correct axis. It's also important to make sure that the stiffness of the system limits mechanical flexure, which relates to the way force is applied to the system. Ultimately, there is more going on than simply constraining the slider motion. It's important to recognize that this problem gets considerably more difficult for the larger systems like the C14 because of the larger mass and longer EFL.